When developing our Bonefish Jigs, we looked to the most successful bonefish flies of all time for inspiration. We combined their best qualities with a healthy mix of Buggs ingenuity. They’re tied on our custom Buggs Bonefish Jig Heads, and are available in 1/16th and 3/16th oz. These heads are made to land hook point up, feature a strong, sharp hook, and are the perfect size to imitate what bonefish eat. Our take on these patterns utilizes bunny strips and synthetic materials to create the most innovative and effective bonefish jigs ever produced! Read on to learn about the four patterns we created. When you’re talking Bonefish flies, the Crazy Charlie will always be part of the conversation. The most famous pattern of all time has caught bonefish all over the world, and inspired countless imitations. Well, we’re not too proud to recognize the genius behind it and imitate it ourselves. 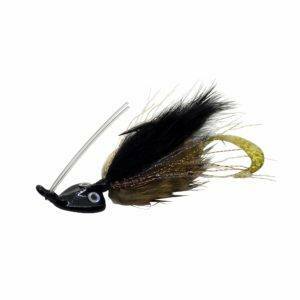 The Loco Bugg fills the need for an understated shrimp or baitfish imitation. Tied with a crosscut bunny tail and bunny wing, there is plenty of action to this bonefish jig when swimming it or at rest. 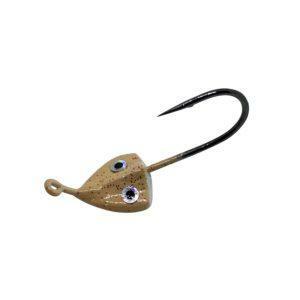 The jig head will make it land hook point up, and give it jigging action on the retrieve. To spice it up a bit, we added hot tipped crazy legs to the wing. These give it even more action, but can be snipped off if conditions demand it. The colors are just what you’d expect, with tans, pinks, and white for natural offerings, and chartreuse and “Fire Bone” to get their attention. Overall you have a versatile and effective bonefish jig for a wide range of conditions, and we believe a worthy imitation of the original! Tim Borski’s Bonefish Slider was the inspiration for the next Bonefish Jig in our arsenal. Having a baitfish imitation is critical when casting to big bonefish, and the slider is the best. 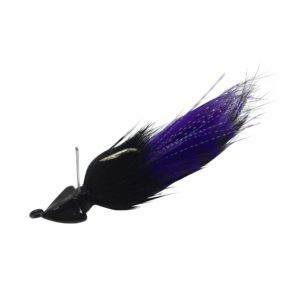 Small, bottom dwelling baitfish like gobies are good meals for flats dwellers, and our Slider Bugg is an excellent imitation. 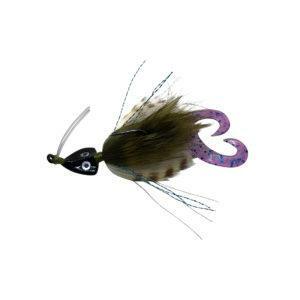 This Bonefish Jig features a double-bunny tail with the barring to imitate these fish. We add a little flash to the tail and then palmer a zonker strip to create thicker shoulders and lots of movement! We finish with a contrasting white belly, giving it a natural appearance and flaring the body even more. These fish have a mottled appearance, so we use barred bunny for the tails and body. They come in tan, olive, and rust colors for a more subtle look. But you know we had to throw in a brighter version, so we created a chartreuse slider. Redfish love this color as well! So we had a small and subtle shrimp imitation and a baitfish imitation. I wonder what else bonefish love to eat? If you said crabs, you won the prize! Jimmy, show them what they’ve won. It’s a Bitty Bugg! 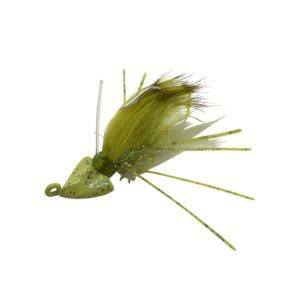 This Bonefish Jig is inspired by the Bonefish Bitters Fly, the most famous little crab imitation around. We figured out a way to tie a short piece of magnum bunny on top and on bottom for maximum movement. And just like the original, we added rubber legs to better imitate a small crab. A little body flash completes the recipe. Again, we took care of the natural colors first. The Tan over White, Olive, and Rust over White combinations are effective imitations. They will serve you well at your favorite bonefish destinations worldwide. But then we had to give a nod to our Gulf Coast friends. We tie the Bitty to imitate a Blue Crab and then a Black version for black drum, sheepshead, and because almost everything will eat a little black jig! Last but not least, we decided to create a Bonefish Jig based on lots of different patterns and a Buggs brainstorm of our own. We were after a realistic shrimp pattern with a twist. We started with the eyes, the feelers, and the crazy legs, and then added an accent color at the head. This hot spot is found on lots of patterns, including spawning shrimp imitations. And the size of the pattern and prominent legs create a good mantis shrimp profile. This jig has created the most buzz wherever we’ve shown it! We offer the widest color selection in the Hot Head Bugg. We’ve got the natural tan barred version, the pink and tan gotcha combinations, and a rust colored shrimp. But we also created a shrimp for fishing under the lights. We use a special UV chenille for the body, glow legs, and bright orange eyes. To top it off, we offer a bright chartreuse pattern when you need to get their attention. These four patterns were inspired by the most successful bonefish patterns of all time. 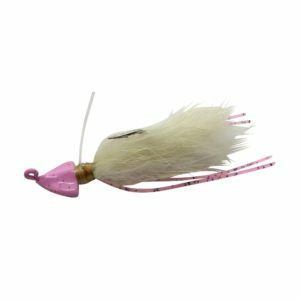 These Bonefish Jigs are tied with bunny strips, synthetic materials, and lots of Buggs ingenuity. They will serve you well wherever you’re chasing bonefish, and in lots of other places where other gamefish are found. We believe these are the most innovative selection of Bonefish Jigs ever produced! 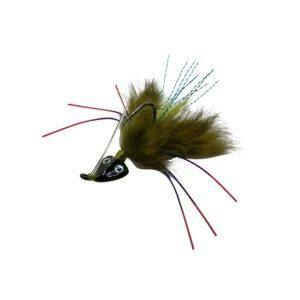 Master fly tyers and experienced fly fishermen will appreciate the construction of these jigs, and the bonefish will second that opinion! For those that tie their own, we’ll be offering the recipes and materials soon. We hope you’ll bring some on your next bonefish trip!